This is a card which I made quite some time ago; I would probably decorate it differently these days, but I like the fold/structure. For the card base, trim a piece of A4 card to 19cm x full length and score at 7cm and 9cm from each side. Cut down 6cm from the top along each score line and remove the excess between, then round off each corner as shown on the template. I used a heavy weight dark brown card for this layer. 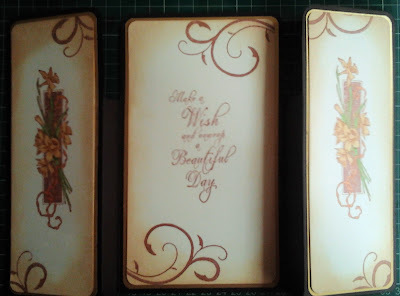 For each topper, I cut a panel of cream card for each large panel (18cm x 6cm x 2 pieces and 18cm x 10.3cm x 2 panels) and also a gold mat for each (18.5cm 6.5cm x 2 panels and 18.5cm x 10.8cm x 2 panels). I used a corner rounder on each of the corners. 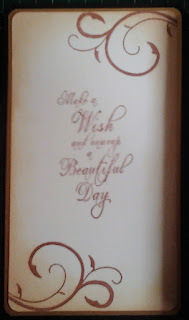 The next step was to stamp a sentiment onto one of the large cream panels and the daffodil flower stamp onto each of the smaller, cream panels, using Sepia Versafine ink. Flourishes were added to the top and bottom of each panel using the same ink. Once the flower panels had been coloured in using ProMarkers, I blended some Brushed Corduroy distress ink around each of the panels. These were then matted up and attached to the front of the card. The larger blank cream panel was matted up and added to the reverse of the card, ready for a written message. Unfortunately, as it is so long since I made the card, I no longer have the stamps which I used and I believe that they have been discontinued. Apologies also for the quality of the photos, these were taken on a very old phone, but they are all I have!